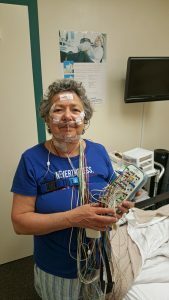 Sleep study? Is there no end to this enforced education? During the most recent HawaiiCon I shared a room with a friend, who mentioned that I sometimes stop breathing when I sleep. Apnea. Since I live alone and my bedmates are of the four-legged variety, nobody had told me before. (Nobody told me that I snore, either, but as of last night it seems apparent that I do.) So I checked the Mayo Clinic’s website for the symptom list for apnea and discovered that a majority of them apply, and told my primary care doc, who said he’d recommend a sleep study. I could have this done in Honolulu or Hilo. I chose Hilo, of course, and yesterday I made sure the beasts were fed, watered, and walked, as needed, early. The appointment was for 8:30pm. It’s a two-hour drive. I don’t know my way around Hilo very well, so I left home at 6:00pm, just before sunset. I haven’t been comfortable driving at night for quite a while now. In my youth it never bothered me. I was happy driving at any time, through any weather, to anyplace but in the past decade my night-vision has suffered and my eyes dazzle easily. When I’m not dazzled I’m peering, and usually end up with a headache. If I can find a reasonably-driven vehicle to follow, I can relax and concentrate on keeping a sensible distance between us, while being aware of what I’m driving past. You know, practical solutions. 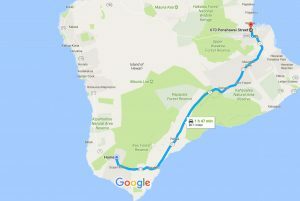 In order to get from here to Hilo, you drive south on the Mamalahoa Highway, past Na’alehu and Whittington Beach, then up the other side of the island through Volcanoes National Park, through the Puna district, past Kurtistown and Mountain View and the turnoff to Pahala, and at long last Hilo sits there, ready to confuse me. Until then, it’s a straight shot on Highway 11. Unless it’s raining and foggy together. Unless it’s raining and foggy and your windshield de-fogger decides to become an Object of Great Mystery. All of which enlivened my drive through the night up one side of the volcano and down the other. I did find sensible drivers to follow, but there is, naturally, a huge distinction between a sensible leader on a clear night and the same leader on a night when visibility is, in a word, kūleʻa. The only not-awful part was near the very top, where Kīlauea is acting up and Halema’uma’u is putting on a light show that paints the foggy sky red and orange and is amazing. The calderas are not visible, so the image is even more mysterious. By the time I reached the sleep clinic, having lost my way the requisite number of times and called for help twice, I was ready to collapse. This was a good thing, considering how Justin, the tech, hooked me up. Electrodes on my calves, on my ribcage, on my shoulders, up my neck and across my face and on my scalp – you can’t see those very well because there’s hair in the way. Oxygen thingies in my nose. I was, I thought, in condition to be propelled willy-nilly into some alternate universe, perhaps where politics make sense and you can eat anything without gaining or losing weight. But no, I was instead in condition to face the prospect of sleeping while wired, strapped, and as a final measure, having my finger secured into an blood-oxygen monitor. Goodnight, apnea poster. Goodnight, “soothing” artwork. Goodnight, web of wires and electrodes. Goodnight, coqui frogs. Goodnight, world. To my surprise I was indeed able to get something approaching sleep (probably brought on by the stress and exhaustion of getting there) punctuated by trying to find a comfortable position (no sleeping on your stomach!) I slept until 2:15, when Justin re-entered the room to plug me into a CPAP machine. Not comfortable, but I am here to tell you that when Justin turned off the light and left the room, I slept deeply, happily, finally. Up at 6:22, not of my own volition, to be unplugged from everything. Sticky tape used to hold electrodes onto my face and neck – ow! Glue used to hold electrodes to my scalp – ick! The rest of them peeled off with no problem. Into my clothes, into my car, down the dawn-lit roads through a sleeping town. I found an open gas station to refill the tank and I bought a cup of gas-station coffee, which was execrable but provided the needed caffeine punch to get me over the mountain and down the other side. Oh yeah, down the other side. When you drive north out of the National Park you face a smooth, curvy drop to the coast, and then an entrapment, an unfairness, a deliberate method of boosting the income of Hawai’i County: a long, straight, gently undulating road, miles of visibility, decent shoulders, a seductive invitation to, well, speed. But I have been entrapped by this section of road before (did you know Hawai’i cops have radar that works in both directions? I didn’t). Technology came to my rescue! I don’t like cruise control because I do like to drive, but this time I set it and laid my hands upon the wheel, not worrying about gas or brake until I came to lower speed limits, then could speed up again. To 60mph. The speed limit’s 55. Yeah, it’s only a two-lane road, but do you have any idea how flat-out boring 60mph is? Home a little after nine, to a chorus of feline and canine complaints. Fed the cats, fed the kitten, walked the dogs, fed the dogs, fed myself, put dogs in dog run, showered to get the glue out of my hair, climbed into bed, and dozed until 11:00. Apnea? A bit, enough to qualify me for a CPAP machine. I don’t know what I think about that. Maybe they make one that fits a bit better than the one at the sleep clinic – I know I’ve grown wider as I’ve aged, but my nostrils aren’t that big! Next Next post: My Passport & Why I Love It.